John Searancke is here with us, today. John, will you tell us about yourself and how many books you have written? John: My name is John Searancke, and I am aged 75. I am married and I have written three books, all of which have been published by the same publishing house. Me: Wow! Congratulations! :-) What's the name of your latest book and what inspired it? 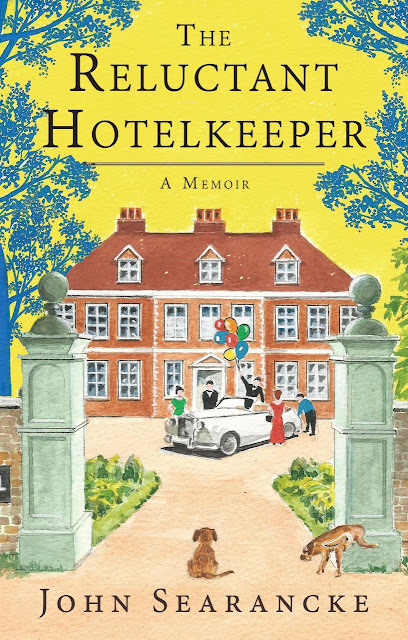 John: My latest book, which has only just been published this month, is entitled The Reluctant Hotelkeeper. It is a prequel to my first book, and tells the story of my life as a hotelier from my early twenties onwards, turning an old ruin into a well thought of country house hotel. Me: Sounds interesting. What are you working on now? John: I have always been an avid reader of books, so nobody especially has influenced me. My reading covers a very broad spectrum. Me: That's a great way to learn to appreciate a variety of viewpoints. :-) What are you reading now? John: I am currently enthralled by Manda Scott and her historical novel about Joan of Arc. Me: Cool! For those who might consider reading your book, what would you tell them to expect? John: That rather depends on which book you read! My personal favourite is Prunes for Breakfast, which tells the intimate story of my father during WW2, from his enlistment right through his time in Normandy and later incarceration in a German prisoner of war camp. Parts of it are a bit harrowing, and required significant research, including to the actual battlefields where my father fought. But judge it for yourself. Me: Sounds like your father lived an eventful life! What is your favorite part of being an author? John: I really enjoy the actual writing process and seeing a story develop into printed words as I create them. There is something very satisfying about that. Me: Yes, the act of creating is definitely a rush. :-) Do you have a day job as well? John: No, too old to employ, and probably too curmudgeonly (says my wife). Me: Ha! What would you say are the hardest, and easiest, parts about being a writer? John: Writing is not difficult. The difficult part is turning your writing into something worthwhile. For that you need the best editor that you can get. I was lucky to have the same editor for all three of my books. Me: Oh, I agree, good editors are definitely worth their weight in gold! What genre do you place your book in? John: All three books fall into the memoir category. Me: Nice! Anything else you'd like to tell your readers? John: Keep reading and keep reviewing! Authors such as myself need you. Me: Amen! And so these fine folks can do just that, are there any links you'd like me to post?